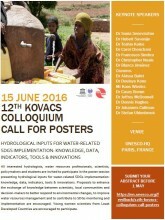 Every two years, the International Hydrological Programme (IHP) of UNESCO and the International Association of Hydrological Sciences (IAHS) organise the Kovacs Colloquium, a series of international scientific meetings in the most challenging fields of water resources research. These meetings also commemorate the late George Kovacs, an established authority on hydrology, who served as Chairman of the Intergovernmental Council of IHP and as Secretary General and President of IAHS. This year, the Kovacs Colloquium will take place at UNESCO Headquarters in Paris, during the 22nd Session of the Intergovernmental Council of the IHP on 15 June 2016. It will comprise several invited lectures, a panel and a poster sessions on the role of hydrology and water resources, particularly on the implementation of the 2030 Agenda, the Sendai Framework for Disaster Risk Reduction and the Paris Agreement of the COP-21. All interested hydrologists, water resources professionals, scientists, policymakers and students are invited to participate in the poster session presenting hydrological inputs for water-related SDGs implementation: knowledge, data, indicators, tools & innovations. Proposals to enhance the exchange of knowledge between scientists, local communities and decision-makers to better respond to environmental changes, to improve water management resources and to contribute to SDGs monitoring and implementation are encouraged. Young women scientists from Least Developed Countries are encouraged to participate. Poster abstracts should not be more than two pages in length, including figures and tables. Two-page abstracts of selected posters will be invited for publication in the final PIAHS e-volume, which will be ISI indexed. See the attached guidelines for poster proposals. Further conditions prior to publication will be communicated to selected authors. To register your abstract submissions, please complete the following form before 1 May 2016. Participants should take care of any related travel expenses and visa process to attend the Colloquium, as the organizers will not cover any such expenses nor undertake any action with regard to visa issues.